Information for Parents and Students. We want to ensure that all students have the best possible time with us in Coláiste Ó Direáin . In order for that to happen, there are some simple rules and guidelines that students must follow. The primary aim of our Irish Language summer courses is to enable the students to achieve real progress in Irish in an atmosphere of relaxation and enjoyment. However, there are a few rules which have to be strictly, though fairly, enforced and we wish these to be brought to the student's and parent’s attention before coming to the College, since contravention of any of these will result in expulsion from the course and forfeiture of fees. The primary aim of these courses is to help the students achieve an adequate fluency in the Irish language and a better understanding of the life of the Irish-speaking community in the Gaeltacht. To ensure that parents and students get full value for money we shall insist on strict observance of our guidelines regarding the speaking of Irish throughout the course. Special help and encouragement will be given to students with little or no fluency in the language but a sincere effort can work wonders! Students who do not co-operate in this regard will be sent home without refund of fee as they deprive other students the opportunity of benefiting fully from the course. 2. Smoking is strictly forbidden. 3. Entry into licensed premises or the consumption or possession of alcoholic drink or drugs at any time during the course is strictly forbidden. 4. Students are not allowed to leave the jurisdiction of the college without special permission. 5. Students may not go swimming or fishing without supervision. 6. Students may not be absent from guesthouses after 10 p.m. without special permission. 7. Misbehaviour, verbal or physical intimidation, intentional or otherwise will not be accepted. Foireann / Staff: The College is staffed by a Principal, Teachers and Ardchinnirí (senior student assistants). The ratio of students to staff averages 1:10. The Department of Education determines the qualifications and sanctions the appointment of staff. The courses are inspected regularly by the Department of Education inspectors. The majority of the staff are native Irish speakers and all staff are required to have suitable experience in teaching Irish to students of varying levels of competency. Cinnirí : Coláiste Ó Direáin has a unique system of cinnireacht or student leadership. The Cinnirí are the backbone of An Coláiste as they are both students and leaders at the same time. Essentially a Cinnire is a person who leads those in his/her group by inspiring them to follow rather than by trying to force them to do something. The good Cinnire will say ‘come on’ rather than ‘go on’. These are senior students /third level students who have achieved a high degree of fluency in the language.We provide a training course at Easter time for 'Cinnirí'. Accommodation: Students stay in the homes of Irish-speaking families, and thus you will hear Irish as it is spoken naturally. This brings the language to life, and you will learn a lot through speaking with and listening to members of your host family. Inspectors from the department of Arts, Heritage, Gaeltacht and the Islands examine these houses on a regular basis to ensure that high standards are being met. The Bean an Tí follows a menu, which has previously been agreed with the College authorities. Any special requirements should be made known to the college beforehand. We make a guarantee that students will be housed with at least one of their friends. Lodging arrangements are made by An Rúnaí and staff of each course. Agallaimh / Interviews: Interviews are necessary for those going to an Irish Summer College for the first time. The purpose of the interviews is not only to determine the level of competency in Irish of the applicants but also to explain the regulations regarding the speaking of Irish during the course. Interviews will be held at convenient locations to parents/students and at least one parent/guardian is expected to attend with each applicant. Classes: Formal language classes are held in the Coláiste from Monday to Saturday every week. Instruction is provided at every level from beginners to Leaving Certificate standard. Students are assigned classes according to age and ability and the Coláiste makes every effort to place each student in a class from which he / she will gain most advantage from their stay. Health and Safety: Coláiste Ó Direáin has a Health and Safety Policy which states that all students have the right to a safe, secure, healthy and stress-free environment on their course, and An Coláiste seeks proactively to achieve this. Teachers and administrative staff are always on duty and activities are organized for the seven days of the week. Local medical services are available to our students should they be required at parents’ expense. Travel: It is important that every student should bring suitable waterproof clothing to the College – windcheater, plastic mac or raincoat and headwear. Sportswear and musical instruments should also be brought and sports equipment (hurley, tennis racket etc.). All details concerning travel will be issued approximately two weeks before the commencement of each course. Music: Students on our Irish Language summer course in Galway, are encouraged to bring their musical instruments and they are given an opportunity to display their talents and add to the enjoyment of the course. The Coláiste including- instrumental group- provide the musical accompaniment at the weekly Mass in the island chapel. Spóirt: There are ample sporting activities to take part in, in Coláiste Ó Direáin. Students are organised into sporting teams, of mixed ages and abilities, another great way of getting to know everyone on the course. Sport takes place, between 3 – 5, both in the college and on the beach. Sports include, cispheil, sacar, eitpheil, uni-hac, agus corr. Tennis, hurling and football are also offered. Leagues take place and on the last night, medals are presented to the winning teams in each sport! An Trá: We are very lucky, as we are only a 5 minute walk away from a beautiful blue flag beach! Many an afternoon is spent here, playing sport, swimming and kayaking! Rothaíocht: Students will have many an opportunity to take in the breath taking views on the island, as well as soak in the history of this magical place. One way to do this is by cycling, and we are lucky enough that the college owns their own bicycles. Siúlóidí: On foot, is one of the best ways to really see Inis Mór in all its glory. Dún Aonghusa and Poll na bPéist are just two of the spectacular sights that you will get to visit during your stay with us. We endeavour to ensure that students get to see all the island has to offer. Seó Talún: our courses are always full of talented musicians, magicians, sports stars to name but a few and we like to encourage all and any talents. A talent show is held on every course where both students and children attending local schools are invited to share their talent with the greater group. All, always, have a great night, so don’t forget to bring instruments! Comórtas na dTithe: Another chance to show off talent, but as a house this time! Each house will work together, to create a short drama, song and dance. They will then perform in front of their peers! This always proves to be one of the highlights of every course! Don’t panic, your “cinnire tí” will be full of ideas! Turas go hInis Oirr: We visit Inis Oirr on every course. It is the smallest of the three Aran Islands, and a relaxing day is guaranteed! There is a lovely beach there, where students can go swimming, under supervision of course! The Placy Boat from the opening scenes of Father Ted is located on Inis Oirr as well. Cill Rónáin: Every Sunday, we visit the main village on the island, Cill Rónáin, where students will have free time to mix and mingle! Topping up credit and sending Granny some nice postcards can be done here too! How do we get to the island? A bus leaves the Liffey Valley Bus Park, in Dublin, and brings you directly to the boat in Ros a Mhíl, or in Co. Galway. The bus will also stop in Kilbeggan , Athlone and Galway, to pick students up. Can we make our own way to the boat? 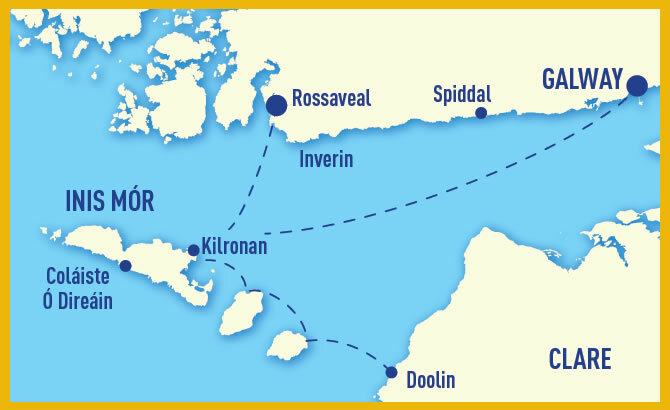 Yes, you can meet us in Ros a Mhíl, before we get the boat to the island, or there will also be a bus leaving Galway city to bring people to the boat. Is it possible to travel from Doolin? There is a boat service from Doolin and it may be used weather permitting. Can we travel by plane to Inis Mór? Yes, Aer Aran provides regular aer service and this can be organised at an extra charge. What happens when we get to the island on the first night? There will be teachers, cúntóirí and cinnirí tí travelling with you on your way to the island. When you land on the island, designated minibuses will bring you to your house. There, you will meet your bean an tí, unpack, have supper and get to know your housemates! Can I be in the same house as my friends? If you are coming to Coláiste Ó Direáin with friends, please name who they are when you are sending your application. We guarantee that you will be accommodated with one or two named friends. What clothes should I bring? Good shoes for walking, cycling and sport are essential. Sun cream is important, as sun and windburn are inevitable! Bring swimming gear and a raincoat might be handy as well! There will be a disco on the last night, so dress to impress! The mná tí are wonderful and will do their best to cater to all dietary requirements. Please provide this information on the application form and also let the Bean an Tí and the cinnire tí know on the first night! If you are an asthmatic, diabetic, etc please make us aware of this and other health issues on your application form or at your interview. An interview…what is this for? This is a meet and greet session for parents and students, to ask questions and get further information on the course you will be attending. These sessions will be held at a venue suitable for you. A short interview will also be held with each student. The purpose of this is to give us an idea of your command of the language so that you will be in the best class to suit your ability, and to ensure your Gaeilge will improve over the three weeks. Are we allowed mobile phones? Mobiles phones are permitted but not during the college day. Your bean an tí will collect the phones before lights out at night, just to make sure that everyone gets a good nights sleep! Can parents come and visit during the course? Of course, parents are more than welcome to come and visit during your stay on the course. We ask parents not to visit during the first few days to allow the proper organisation of the course. Sunday is the best day to visit as students have a free morning and will be in the village and can even meet the 10.30 boat on Sunday morning. To arrange a visit, your parents simply have to ring the college 099.61214 and arrange the visit with a teacher.There are many ferry crossings to the island, which leave from Ros a Mhíl in Connemara and Doolin in Clare. There is also an Aer Service from Inverin.Mini-buses, bicycles and horse and traps are available for hire on the island. Accommodation can be found in many lovely B&B’s, Guest Houses or the hotel on the island. Booking ahead is advisable during busy times of the summer. Get in touch, we'd love to hear from you. Coláiste Ó Direáin, Fearann an Choirce, Cill Rónáin, Oileáin Árann, Co na Gaillimhe.